You would think that a drop leaf corner table would not be that difficult to build. This one will challenge you, especially the turning of the leg with the offset foot pad. Plenty of details as you would come to expect from such plans. 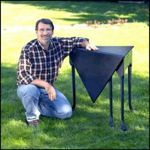 A Drop Leaf Table for Patio or Lawn Vintage Woodworking Plan.